My birding bucket list is mostly in my head and hopelessly long. It contains birds I want to see, places I wish to go and milestones I hope to achieve. For some items, I’ll need some big-time luck. One aspiration, for example, is to host a rare bird in my yard—an accidental tourist, the showier the better, and one that hangs around my feeders for at least a week. I’d invite birders from near and far to come see my special guest. They’d sign my guest book. We’d gab about birds and gear and trips. I might even serve coffee and donuts. The scenario isn’t so far-fetched. 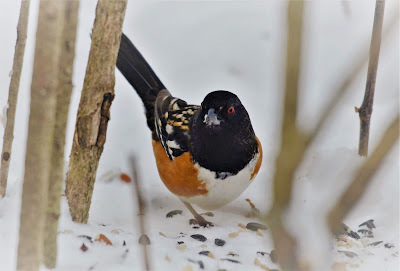 I’ve been on the visiting end of backyard “stakeouts” several times, most recently this winter, when Warrenville homeowner Kate Hopkins hosted a spotted towhee. Her generosity enabled dozens of birders to experience a western species that for some was a new tick on the life list. Kate first noticed the towhee at her feeder on January 21. She initially figured it was an eastern towhee, which itself would be a notable sighting in the dead of winter. But after applying the Merlin ID app she realized it was a spotted and posted her discovery on eBird. That alerted area birders, many of whom wanted to stop by for a look. 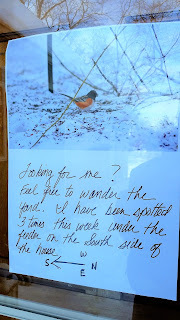 Incoming birders were directed to Kate’s side yard by a handwritten note on the front door, complete with a photo of the wayward towhee. Her busy feeding station offered plenty to see while waiting for the main attraction, including a handsome Carolina wren. Observing the spotted towhee was just a matter of patience. My wait was only 20 minutes—quite fortunate since the temperature was slightly below zero. Others waited longer or had to return for a second or third try. Kate has no idea how many birders stopped by—she works during the day—but tracks in the snow indicated a steady flow of thrill seekers. Some left thank you notes, birdseed donations and even a box of Earl Grey tea. Others showed their appreciation by sharing photos of her avian celebrity and posting thankful messages on the Illinois Rare Bird Alert Facebook page. Kelly wisely notified the local police about the situation and credits her neighbors for being understanding. The “circus” lasted about six days, during which Kelly got to know the visiting birders. I didn’t attempt to see Kelly’s varied thrush. At the time, a mad dash to Palos didn’t fit my schedule. Besides, I’d seen the species once before—not in the Pacific Northwest, where it belongs, but in Evanston. That’s correct, I owe my “lifer” varied thrush to a different backyard stakeout six years ago. I remember that Sunday morning well, standing in a snowy alley, my toes almost numb, gazing over a neck-high wooden fence into the homeowners’ private space. My cold, lonely vigil lasted about 90 minutes before the target bird took pity on me and flew in to the platform feeder. Instantly, my feet felt warmer. If this column is a bit tardy, blame “The Feather Thief.” It stole my time! If the next book I open is only half as good, I’ll be happy. My previous piece recapped the 2018 birding year. However, since that rambler was submitted in mid-December, it omitted a few developments from the year’s final weeks. Today I’ll close the loop and cover some early highlights of 2019. So, remember that piping plover in Chicago? To refresh, the bird first visited Montrose Beach in October and stayed until early December—by far the latest record for the species in Illinois. The plover vanished for several days, then made history in a second state by appearing December 15 on the beach at Indiana Dunes State Park, just in time for that area’s Christmas Bird Count (CBC). But the story wasn’t over. On December 22, the feathered mighty mite reappeared at Montrose! The plover was easily located by Evanston North Shore Bird Club members on Christmas Day during their Chicago Lakefront CBC. I guess some birds just want to be counted. The plover rang in the new year at Montrose and was last seen on January 13. The backyard yellow-throated warbler in St. Charles also departed, hopefully for warmer climes. Homeowner Jon Schuler last saw it on December 23. Warblers in winter are rare indeed, the one exception being yellow-rumped warbler. “Butterbutts” are uncommon this time of year but we do see a few. The species is content to eat berries, seeds and suet when other warblers head south to maintain their bug-based diets. Nine yellow-rumps were recorded on the Fermilab CBC and they popped up all over the region in January. Keep an eye out, especially if your yard features bayberry, juniper or a heated bird bath. Common yellowthroat, another warbler species, was sighted during both the Fermilab CBC and Lisle-Arboretum CBC. Nashville warbler was a coveted discovery at the Kankakee Valley CBC, along with white-eyed vireo. A palm warbler appeared in Cook County on January 11. The Lisle-Arb CBC, by the way, held December 16, turned up 21 pileated woodpeckers—a record-high for the species. The previous best was 13 in 2017. These numbers support the widespread notion that our local pileated population is growing. Flocks of sandhill cranes staged a rare January passage over DuPage and Kane as the year began, but the big story was a black-legged kittiwake, observed January 1-5 at Whalon Lake Forest Preserve in Will County. 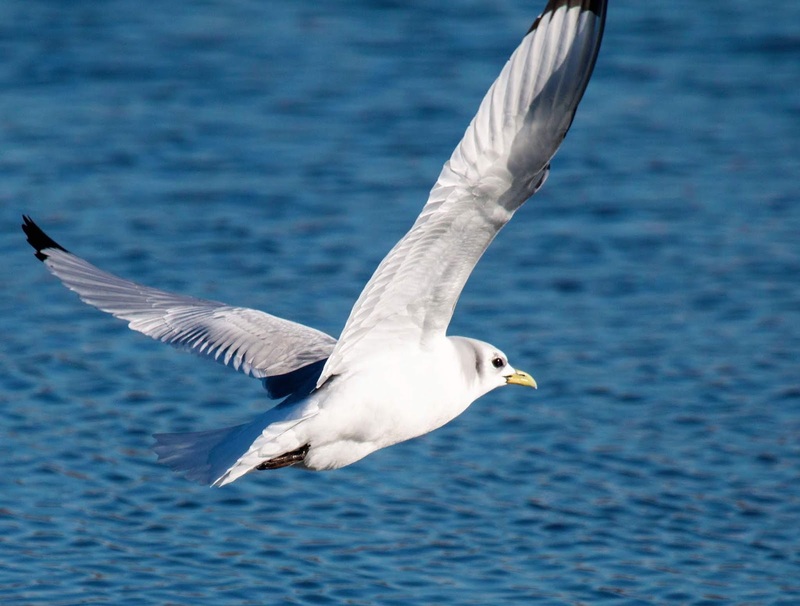 The kittiwake, a coastal gull species seldom observed inland, could easily have been overlooked. Kudos to Kirk LaGory from Downers Grove for picking it out and sharing an exciting find. A rarity of a different color—actually, many colors—turned up in Orland Park. A Mandarin duck! First reported by Susan Zelek on January 4, where it came from is still a mystery. Like the Mandarin in New York’s Central Park that caused a sensation last fall, the Orland bird is possibly an escapee from a zoo or private collection. 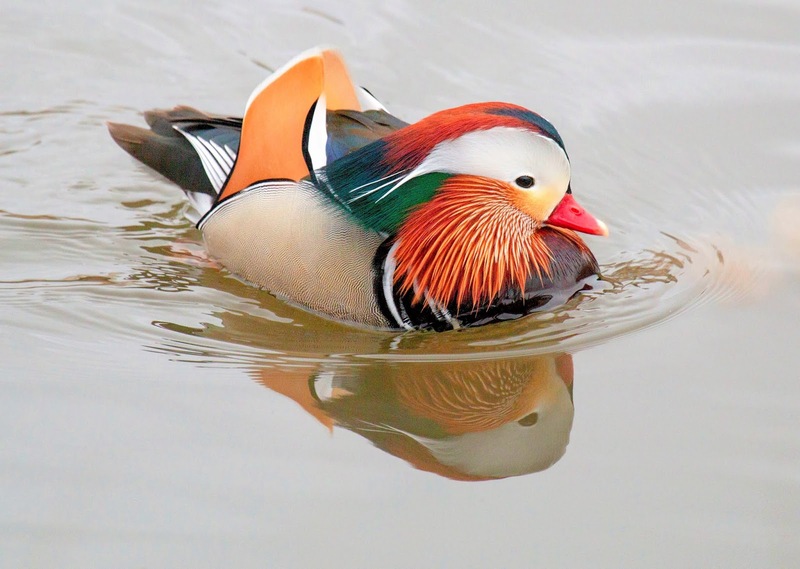 Mandarin duck is a non-native intruder, an Asian species. But there’s no denying its beauty. Only our male wood duck comes close to matching the Mandarin’s spectacular plumage. In fact, thanks to Bob Andrini, a St. Charles birder, I learned the two species are related—the only members of the Aix genus. As the deep freeze settled in, yet another January surprise, a spotted towhee, found a busy backyard feeder located near Wheaton Warrenville South High School. 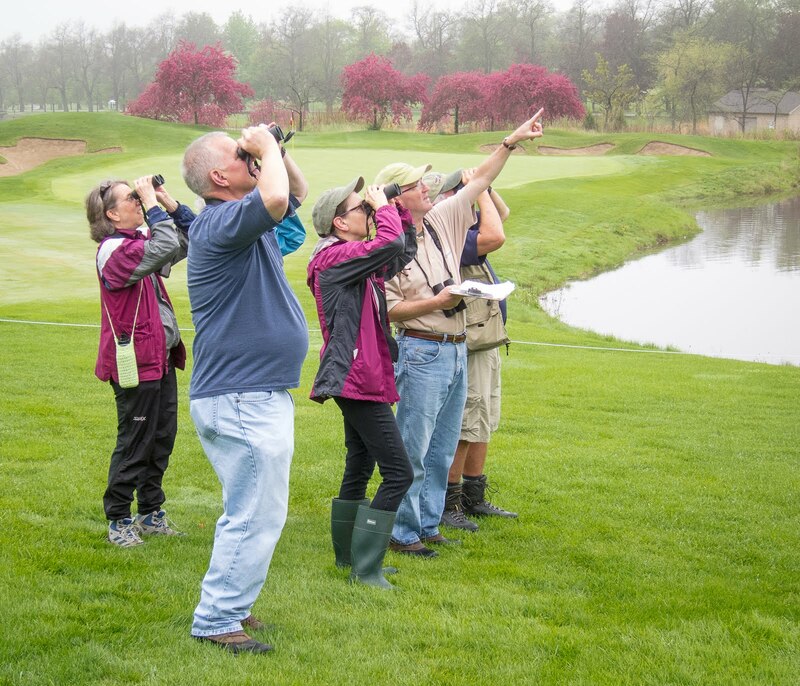 Kate Hopkins reported the bird and generously opened her yard to visiting birders. I was among them and besides the towhee (a western species) witnessed the yard’s other featured visitor, a Carolina wren. As if that weren’t enough, some lucky birders received a further bonus when a pair of unusual red-bellied woodpeckers flew in; their head markings were yellow instead of red! Such moments must be savored because winter birding in northern Illinois is not always so exciting. As watchers, it pays to stay alert as we count the days until spring. Meanwhile, keep your feeders stocked and enjoy the show, especially when it snows. Cyber birding is fun option, too. My guilty pleasure lately has been the Cornell Lab’s feeder cam streaming live from Manitouwadge, Ontario. With a few clicks (and a little patience) you can observe guest appearances by evening and pine grosbeaks, Canada jays, ravens, redpolls and even ruffed grouse. Google Ontario FeederWatch. Of course, nothing beats a good book on a cold winter night. If you need a recommendation I can help.